Political Prisoner Hossein Ronaghi Maleki, now incarcerated in Evin Ward 350, is facing deteriorating health due to confiscation of his medication by prison officials. Human rights activist Hossein Ronaghi Maleki reported back to Evin prison on Tuesday, May 21, 2013, following the denial of his medical furlough extension due to the upcoming presidential elections. Due to negligence by prison officials and Evin’s medical clinic, Ronaghi has not yet been able to access his needed medication. Upon returning to Evin, all of Ronaghi’s personal effects and medications, which must be taken daily, were confiscated, despite the fact that he is suffering from kidney disease and malfunction, inflammation of the prostate and bladder problems. According to specialists and the medical examiner, the prison environment, with it’s lack of access to a specialized medical facility and treatment, and lack of proper nutrition, is not suitable for Ronaghi. But Tehran Prosecutor authorities have refused to extend his medical furlough. Recalling Ronaghi and a number of other political prisoners back to prison was apparently done in order to create a more rigid security atmosphere ahead of the upcoming presidential election. Ronaghi underwent surgery at Hasheminejad hospital a few weeks ago. After much efforts by his surgeons, the proper treatment and a non-prison environment, his condition was reported “fair”, with the functionality of his left kidney at 17% and the right kidney at 83%. But now, with his return to prison and lack of access to adequate nutrition and medical treatment, it is feared his health will rapidly deteriorate. As the presidential election nears, a number of political activists have been summoned, homes of some activists searched and a number of activists who were planing to open a campaign office for Hashemi Rafsanjani have been arrested. Among the arrested are, Hamid Hadisi, Ebrahim Khoshsirat, Mourice Bagheri, and Mr. Jafari the chair of the Participation Front in Lahijan. Since their arrest six days ago, the detainees have had one short phone call to their families. All of the activists arrested were transferred to IRGC’s detention center in Rasht. Last Sunday they were all taken back to Larijan and arraigned in court then transferred back to Rasht. Masoud shams Nejad, an attorney and on the faculty of Payam Nour and Azad universities in Orumieh, was arrested on Thursday May 9, 2013 and transferred to Orumieh prison after initial interrogation. According to reports, shams Nejad is currently in Orumieh prison and since his transfer there all phone contacts from the ward he is incarcerated in have been cut off. As of to date reason for his arrest still unclear. Masoud Shamsnejad is the defense attorney for death row political prisoner Habibollah Golparipour who for unknown reasons three days ago was transferred out of Semnan prison and taken to the central prison in Orumieh. Habibollah Golparipour was arrested 2007 on charges of affiliation with a banned Kurdish group and was later tried and sentenced to death. His death sentence has been upheld by the Supreme Court. Branch 26 of the Revolutionary Court, presided by Judge Pirabbasi, has sentenced Mohsen Ghashghaei to 2 years imprisonment on charges of assembly and collusion with intent to act against the national security. Branch 1 of the Revolutionary Court, presided by Judge Ahmadi, has sentenced Mohamad Reza Ahmadi to 3 years imprisonment on the same charges of assembly and collusion with intent to act against the national security. Mohamad Reza Ahmadi’s 1 year suspended sentence from a previous conviction, now becomes mandatory and will be enforced. Previously, three members of the Association of Writers were sentenced to imprisonment. Akbar Amini was sentenced to 5 years, and Pezhman Zafarmand and Mohamad Parsi were each sentenced to 3 years imprisonment. According to reports, the members of the Association of Writers have been under pressure, a number of them have been summoned by the Intelligence Ministry within the last few weeks, and many have received threatening phone calls. Following a raid on Tuesday, October 30, 2012 on an Association of Writers meeting, seventy Association members were arrested. All except 17 members were released shortly thereafter. Those 17 members, including Dr. Mehdi Khazali, were transferred that night to Evin prison. Two other members, Pezhman Zafarmand and Mehdi Karimi, were later arrested by agents and taken to Evin prison. Following the heightened security atmosphere and added pressure on political activists in cities across the country, city of Behbaha political activists Javad Aboali And Mohamad Danaei have been arrested. Mohamad Danaei was arrested by agents on April 25, 2013, and Javad Aboali was arrested on May 9, 2013, both in Behbahan. According to the Kalameh site, Behbahan’s Judiciary officials claim they have no information about these arrests. To date, the arresting agency, the reason for arrest and the detention location of these two activists are still unclear. Prior to his latest arrest, Javad Aboali had completed his previous sentence on the charge of propaganda against the state. 10 political prisoners incarcerated in solitary confinement in Evin Ward 240 have launched a hunger strike following the prison officials’ failure to fulfill their promise to return them to the General Ward 350. Incarcerated in solitary confinement and demanding to be returned to Ward 350, the following prisoners have launched an open ended hunger strike. Following the transfer of these 10 political prisoners to solitary confinement on Sunday April 28, they had announced they would launch a hunger strike. But due to requests from their fellow prisoners and promises made by the officials, had delayed the launch of their hunger strike. However, due to failure of the officials to keep their promise to move them back to Ward 350, they started their hunger strike as of Monday night. Reports indicate that these 10 prisoners are in complete isolation and are deprived of basic rights and recess time outside of their cell. On Monday, the regular visitation day, the families of these prisoners were denied visits with them. Also on Monday, political prisoner Mohamad Amin Hadavi, in protest of the treatment of the 10 prisoners. refused to go to the visitation room . Saeed Madani is in need of gallbladder surgery. Abdollah Momeni is suffering from kidney, gums and teeth problems. Abolfazl Abedini Nasr is suffering from kidney and heart condition. Saeed Abedini is suffering from gastrointestinal and digestive problems. Mohamad Ebrahimi has a lung problem. These prisoners have remained in solitary confinement since April 28, and the Deputy Warden, Javad Momeni, has made additional threats against them. Also, the Judiciary officials have told the wife of Abdollah Momeni that these prisoners will remain in solitary for 20 days. I will continue to sail. On the illuminated solitude of the fishermen. The woman of that city was not brimful like a cluster of grapes. No hall of mirrors reprise raptures. A puddle of water, did not even reflect the light from a torch. Now it is the window’s turn to open. I will continue to sing. The rooftops are the domain of pigeons that gaze at the fountain of human intelligence. The hand of each ten year old child in the city, is endowed with the house of knowledge. As though, it is a flame, a tender sleep. And the fluttering sound of the wings of mythical birds are heard in the wind. Where the sun is as vast as the eyes of the early morning risers. The poets are the inheritors of water, wisdom and illumination. Beyond the seas there is a city! One must build a boat. A total of 11 years imprisonment and a 15 year ban on any political, civil and or online activity has been issued for three members of the Writers Association (Sarai Ahle Ghalam). Akbar Amini – Sentenced to 5 years imprisonment, 4 years on charges of assembly and collusion with the intent to act against the national security, and 1 year for propaganda against the establishment. As part of his sentence Amini is also banned for 5 years from membership in any political party or group and banned from any online journalistic activities. Amini was also under a one year suspended sentence from a previous conviction that now has become mandatory and will be enforced. Pezhman Zafarmand – Sentenced to 3 years imprisonment on charges of assembly and collusion with the intent to act against the national security. Zafarmand is also banned from any political activity or any online journalistic activity for 5 years. Mohamad Parsi – Sentenced to 3 years imprisonment, 2 years on charges of assembly and collusion with the intent to act against the national security, and 1 year on charges of propaganda against the establishment. Parsi is also placed on a 5 year ban from membership in any political party or group and any online journalistic activity. About 70 people were arrested during a raid of the Writers Association meeting on October 30, 2012. 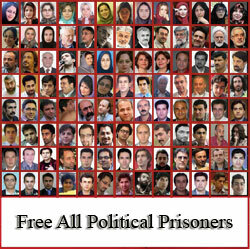 Many were released shortly after, but 17 members were taken to Evin prison. Dr. Mehdi Khazali was one of the members arrested that night. Currently he is the only member that is still incarcerated and is on a hunger strike protesting his illegal arrest and detention. Pressure and threats continue against the members of the Writers Association since the night of the raid on their meeting. Other members have also been summoned by court. Despite a visit by the Deputy Judiciary Chief, the 10 political prisoners who were moved to solitary confinement in Evin Ward 240 on Sunday, are still incarcerated there, and the Deputy Warden of Evin prison has threatened that the other 35 prisoners protesting this illegal move will be confronted and punished. According to reports by the Kaleme site, the 10 prisoners continue to be in solitary confinement and are also banned from visits. On Monday, the regular visiting day for Ward 350 political prisoners, 35 prisoners protesting the illegal transfer of the 10 prisoners to solitary confinement, refused to go to the visiting room. The Deputy Judiciary Chief and the head of Iran’s Bureau of Prisons, Esmaeli, was in Evin on Tuesday to follow up on the situation of the 10 prisoners in solitary and the Ward 350 prisoners. In the past two days, a number of the 10 prisoners in solitary confinement have been taken to Evin’s clinic in poor health condition but returned back to Ward 240 solitary confinement. Also, prior to transfer of Saeed Madani to solitary, the medical examiner had instructed that he must be sent to hospital for gallbladder surgery. However, at this time it is not known if, or when, Madani will be sent for surgery. On Sunday, a number of Ward 350 political prisoners had volunteered to also be transferred to solitary confinement as a show of support for the other prisoners transferred to solitary. They are ready to go to solitary confinement if their friends are not returned to the General Ward. The 10 political prisoners transferred to solitary confinement have threatened to launch a hunger strike if they are not returned to the General Ward 350 by the end of this week. Javad Momeni, the Deputy Warden at Evin, who’s actions were part of the main reason for the prisoners’ protest on Sunday, has said that the 35 prisoners who refused to go to the visiting room on Monday will be dealt with and will be punished.